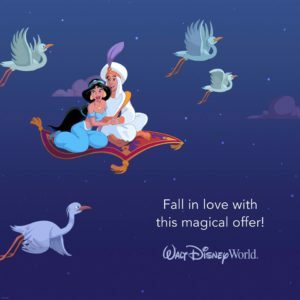 Now is the time to book a Walt Disney World vacation and get the most for your money with these new offers! Choose from a room discount offer with an extra day of tickets or enjoy one free quick- service meal per person, per night! 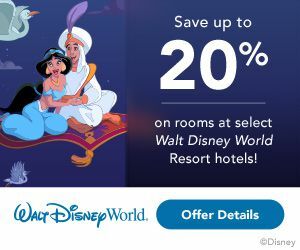 You can save up to 20% on rooms at select Walt Disney World Resort hotels. Percentage varies depending on resort. For stays most nights February 18, 2018 – April 14, 2018 when you book through March 7, 2018. For stays most nights April 15, 2018 – June 10, 2018 when you book through April 7, 2018. 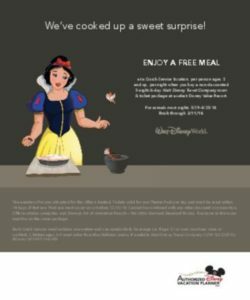 You can enjoy in one FREE meal per person (ages 3 and up), per night at a select Walt Disney World® Resort quick-service dining location when you book a non-discounted 5-night/6-day room and theme park ticket package at a select Disney Value Resort hotel. Offer valid for arrivals most nights May 29, 2018 – August 25, 2018 when you book through February 11, 2018. *The number of rooms allocated for this offer is limited. Length-of-stay requirements may apply. Savings based on the non-discounted price for the same room. Additional per-adult charges may apply if more than two adults per room at Disney Value, Moderate and Deluxe Resorts. Cannot be combined with any other discount or promotion. Advance reservations required. Offer excludes 3-bedroom villas, Cabins at Disney’s Copper Creek Villas & Cabins at Disney’s Wilderness Lodge, Bungalows at Disney’s Polynesian Villas & Bungalows and Disney’s Art of Animation Resort–The Little Mermaid Standard Rooms. 20% savings based on the non-discounted price of the same room for select Disney Deluxe and Deluxe Villa Resorts. Lower savings may be available for other select Disney Resort hotels. **The number of rooms allocated for this offer is limited. Tickets valid for one Theme Park per day and must be used within 14 days of first use. First use must occur on or before 12/31/18. Cannot be combined with any other discount or promotion. Offer excludes campsites and Disney’s Art of Animation Resort—The Little Mermaid Standard Rooms. Everyone in the room must be on the same package. Each Quick-Service meal includes one entrée and one nonalcoholic beverage (or, if age 21 or over, one beer, wine or cocktail). Children ages 3-9 must order from the children’s menu, if available.